Eliciting implicit values is a developing area of values-based practice and there is no canonical or established method appropriate for all situations. One approach, developed by the British social scientist, Anthony Colombo, is through people’s responses to a case vignette. This was used in a study at Warwick University funded by the Nuffield Foundation, of the implicit values of those concerned (as service users and as service providers) in the community care of people with long-term schizophrenia. This section describes The Models Project and the striking differences between explicit and implicit values at the heart of What Colombo Found. It was these differences that led to the concept of the Extended Multidisciplinary Team as the basis of person-values-centered care in values-based practice. A simplified version of the methods developed in Colombo’s study is used for training in ‘knowledge of values’ as the third skills area supporting values-based practice (see Whose Values? A Workbook Section 5). Colombo’s Models Project used a standardized interview and scoring system to assess responses to a case vignette of an imaginary person called Tom. The questionnaire covered twelve aspects of how Tom’s situation might be understood and managed. 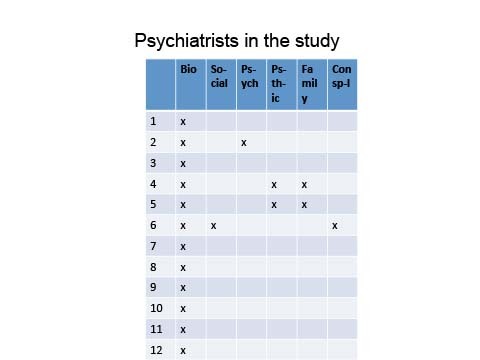 Mapping these responses onto six main models of mental disorder (biological, social, psychological, psychoanalytic, family and conspiratorial [or political]) thus gave a six-by-twelve visual representation of the implicit model of an individual or group. A ‘model of disorder’ is a set of ideas about what is important about a disorder: the biological model for example emphasizes diagnosis, physical causes (genetics, brain amines, etc) and medication. The six-by-twelve models grids produced by Colombo’s method thus described the implicit values this or that individual or group brought to understanding ‘Tom’. The study covered team members (psychiatrists, social workers and nurses) and service users (patents and carers). 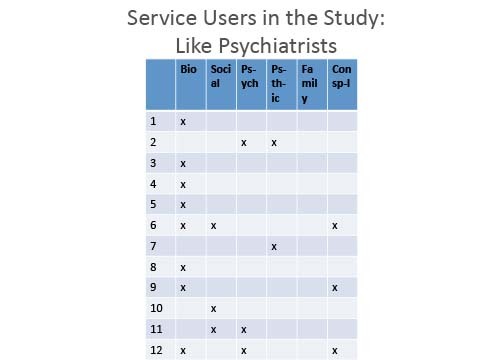 Asked directly, team members involved in the study all claimed that they worked with a balanced biopsychosocial model (this was their explicit value commitment). But their responses to Tom revealed very different implicit models. 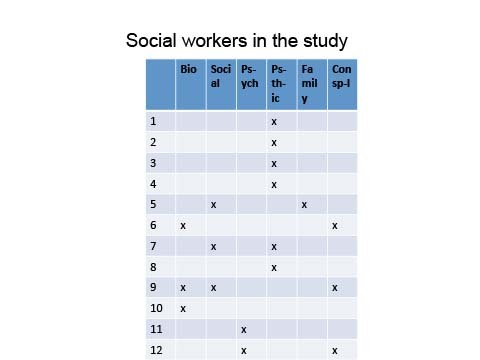 Psychiatrists in the study showed a predominantly biological set of responses (represented here by ‘x’s’ mainly in the left hand column) while the responses of social workers were more psychological and social. Psychiatric nurses (not shown here) gave split responses with mainly biological ways of understanding ‘Tom’ and psychological and social ways of helping him. Recognizing such differences of implicit values among team members is important for effective communication and shared decision-making. But the differences themselves are also important in their own right for person-centered care. This is because patients involved in the study divided into two groups showing essentially the same differences of implicit values as team members. The parallel differences in implicit models between patients and team members found by Colombo underpin a key element of values-based practice, the extended multidisciplinary team as the basis of person-values-centered care. Person-values-centered care is care that is tailored to the particular values (the needs, wishes, preferences and so forth) of the individual concerned. 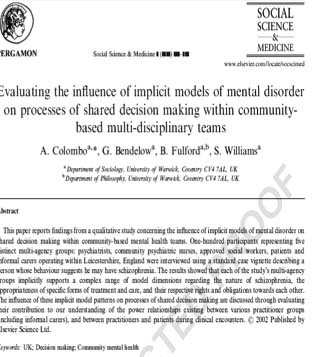 The parallel’s found by Colombo between team members’ and patients’ implicit models have the consequence that differences in team values are a resource for delivering person-values-centered care. This is why the multidisciplinary team of values-based practice is an extended multidisciplinary team. Multidisciplinary teams are important for the range of different knowledge and skills they bring to patient care. In values-based practice the importance of multidisciplinary teams is extended to include also the different values they bring to patient care.